Small Town Boy – Share God's Grace. An outsider in Jewish culture was someone who disobeyed the sacred Mosaic laws. Insiders lived carefully structured lives around the ancient traditions of Jewish faith. In the stratified society insiders made rules which shielded and isolated them from sinners. During a brief period of three years the insiders, entrenched in their orderly world of laws and righteousness, would be challenged by a young carpenter’s son from a village which nothing good could come from. In declaring “But many who are first will be last, and the last will be first.”[i] Jesus would force an ingrained culture to re-examine its values and seek a deeper, richer relationship with God. He would open a new highway to those who were lost. For God declared; “But my people have forgotten me, they burn offerings to a delusion; they have stumbled in their ways, in the ancient roads, and have gone into bypaths, not the highway”[ii] In Jesus there was a new opportunity to follow a highway which affirmed “the last will be first”. Jesus was nurtured in a faith that was made genuine by the conditions in which his people lived. Their honest intelligence was tempered by a down-to-earth attitude which must have been instilled in the young boy. The faith Jesus grew up with was neither theoretical or academic but real and pragmatic. Being raised in a poor Jewish community, his compassion would have been for those outside the laws and inside God’s heart. 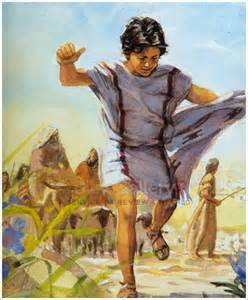 To the people of his times, Jesus was approachable, even if they had to sneak up and touch the fringe of his robe. He opened himself to criticism from his community and allowed supporters to question his authenticity. Jesus’ character was formed by the human community he lived in. His compassion and wisdom were learned from his parents and elders of his village. So when Jesus began his ministry he taught in ways the common people could understand and they could relate to his teaching and parables. He could also speak with the “elite” of Jewish society, both winning converts and engendering fear among them. His clear-cut arguments and simply told parables silenced his critics and brought understanding to his followers. He would teach that God was authentic and relevant and that lives could be transformed, not by miracles but by a real and genuine relationship with God. The New Testament and the Gospels in particular where meant to bridge the chasm between God and man and make God “approachable”. Jesus may have behaved in a manner expected of the “anointed one”, who was empowered by the “spirit” to challenge authorities and have mercy for the poor. However the strength of his character would also have come from a caring family and nurturing community. His defiance of authority was driven by the injustice his people endured under Rome and Herod. His compassion fostered by struggles of the people in his community and his boldness by the heritage of a proud race long oppressed by succession of conquerors. All four Gospels display a political image of Jesus, one that looks good on paper and has all the right “sound bites”. However the longer narrative and deeper characterization in Luke’s account gives a greater human texture to the story. Not only in the persona of Jesus but in the people whose lives intermingle with him. By giving greater depths to Mary, Joseph, Zechariah & Elisabeth we have a deeper understanding of the family which nurtured the child. We see that the relation with John the Baptist was familial and that there was a greater interaction between all the individuals that encountered Luke’s Messiah. Because these people are more human, it makes Jesus more human. The stories of healing and restoration established the presence of God’s saving grace and gave Jesus credibility. But there were others in the land performing miracles as well. The character of Jesus is better understood in his teaching rather than his healing. The Bible does not define the poor by economic standards. Jesus understood that those who are poor in spirit and do not know the word of God required ministering. Zacchaeus was a prosperous tax collector who did not know the wealth of friendship. By inviting himself to the home of Zacchaeus Jesus risked the same sort of poverty that plagued the tax collector. “All who saw it began to grumble and said, “He has gone to be the guest of one who is a sinner.”[xii] However he took the risk and offered salvation to the house of Zacchaeus. Years ago I heard Will Rogers quoting President Calvin Coolidge as saying “Everyone I meet is doing well. They have to be doing well or I don’t meet them.” Many devoted members of my church, including myself, could make a similar claim. Everyone I meet is a good Christian. They have to be a good Christian or I don’t meet them. Perhaps we have become too ensconced in our comfortable communities and like the Jewish insiders of Jesus’ time, have isolated ourselves from the poor in spirit. Perhaps those outside our churches, our children, neighbors and co-workers do not think we understand their situations or problems. It’s possible that our ministries are based on what we have achieved and now possess rather than what God wants us to do. When we read the words Jesus spoke to Peter “…you are Peter, and on this rock I will build my church and the gates of Hades will not prevail against it.”[xiii], are we inclined to defend the bastion of our faith against Satan’s citadel, rather than attack and destroy it? It may not be necessary to attack hell’s gates but neither should we shut our doors to those who seek refuge. A community dedicated to God should be infused with charity, compassion justice and mercy. These values are at the heart of our Christian-Judeo faith. They are tempered in the crucible of human communities and should be taught to our children as bedrock values. Jesus was raised in a good Jewish community in which these standards were instilled. Because of his upbringing, his words and actions connected with people on a human level. In many ways the church has lost that connection to the community. Like Jesus, we need to draw upon our human families in order to be “approachable. God asked Ezekiel, “Mortal, can these bones live?” As God breathed life into the bones of Israel, we need to breathe life into the New Testament so our savior becomes a living person once again. Behavioral science may debate if a person is born with an innate sense of fairness and justice or acquire them in a nurturing environment. As God incarnate did Jesus require moral discipline from his human family? If he did not, why was he born into this world? Why not simply appear and begin his transforming work immediately? David was a young boy when God choose him from Jesse’s sons. Abram was middle age and decades away from becoming a “patriarch” of God’s people. Surely God must have felt that the dynamics of human interaction was essential to preparing those he chooses to lead. Each member of the human family struggles with love and hate, acceptance and rejection, joy and despair, friendship and loneliness. Shouldn’t those who God selected also know these things; shouldn’t their lives have been shaped by human relations? When they were thrust upon the world stage their experiences were used to change the world, not to maintain the status quo. Perhaps that’s why God allows us to experience life in all its complexities and dynamics. Neither justice nor mercies are abstract ideas. They are not equations with absolute and definable answers. Nor are they an elusive goal we struggle to obtain. They are part of the process which propels us along through a life filled with events, not toward a preset goal or final destination. The things we learn from our family, our community and our faith do not have their crowning achievements in either justice or mercy. They are the means, along with faith, hope and love by which we share God’s grace.